Apple's take on augmented reality (AR) is poised to launch with iOS 11 soon, and we're finally seeing what that means for the iPhone and iPad thanks to ARKit. While the rest of the mobile industry is obsessed with creating virtual reality (VR) experiences to replace your world, Apple is focusing on augmented reality, which overlays virtual graphics on top of your existing environment. Think Pokemon Go, but not limited to catching monsters in your neighborhood. Ideas are being teased by household names like IKEA, the Food Network and, yes, even the AMC TV show The Walking Dead. Apple CEO Tim Cook likes to talk about AR's potential during every earnings call we report on, so there's clearly a big push for it on Apple's campus and a lot of excitement from developers. Even if you don't plan to upgrade to the rumored iPhone 8, here's what this means for you, days before iOS 11 arrives on your iPhone and iPad. iOS 11 is about to give Apple the largest AR platform in the world – overnight. Its millions of iPhones and iPads are AR-compatible with a simple software update. Apple created an augmented reality ecosystem within existing hardware instead of trying to invent a new device based around AR, like we've seen with Google Project Tango (though Google did just announce its own ARCore initiative). It's an instant boon for augmented reality fans and developers alike. Starting out with a giant install base means more games and AR experiences will be made for the iPhone and iPad. No one wants to make AR for a few thousand devices. We're now seeing the first iPhone and iPad AR demos outside of what was shown at the WWDC 2017 keynote and 'Introduction to ARKit' session in June. Here are some videos of iPhone and iPad AR games in action, including from demo from The Walking Dead game developer Next Games courtesy of TechCrunch. Games drive adoption of new technology, as we've seen in the last decade from Blu-ray (PS3) to the App Store (on PhoneOS 2). They'll again do that for AR this year. But, don't worry, ARKit has already become a platform for more than just games. IKEA is bringing its furniture to Apple's iOS 11 ARKit sandbox, letting you place virtual items right next to physical objects. How does that sofa look next to your existing chairs? This app can give you some color and size perspective. Remember when people used to hold up tile samples for perspective? 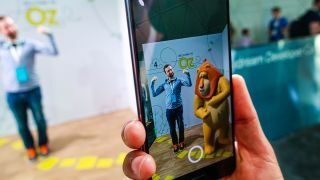 We also really like the fact that storybooks are being brought to life in the form of apps like The Very Hungry Caterpillar AR, and how animated emojis are about to break into your real life with the help of GIPHY World. As you can see, there are some practical, educational and goofball AR apps planned for iOS 11. Apple's iOS 11 augmented reality features are compatible with any iPhone and iPad that has an A9 chip or greater, it was announced at Apple's WWDC. For tablets, that means any Pro tablet or even the new $329 iPad works with AR games and apps, and the iPhone 6S and iPhone 6S Plus works just fine, too. Best of all, there's no external hardware required. No HTC Vive lighthouses, no Oculus Rift constellation sensors, none of that. iOS 11 is an exciting jumpstart for mobile AR, and yet its potential far exceeds the existing games and demos we've seen. That's what should have you most excited about the iOS 11 update. What could AR's future hold? You could soon be able to find your seats in a crowded stadium with a personalized pathfinder, or track down all of your groceries among a store's many aisles – all by looking through your phone like it's a lens, theorizes veteran Apple analyst Gene Munster. Solving big problems, and ultimately destroying inane questions of "Where are you?" or "Where do I go?" could be accomplished with an AR dotted line. Apple seems to be on that roadmap, and we'll see its AR vision in a matter of days.